The American Psychologist and sociologist Graham Gibbs issued a model of reflective cycle in his famous book known as ‘Learning by doing’ in 1988. Gibbs reflective cycle inspired individuals to think thoroughly about the different phases of an activity or experience. Using this model, reflection on those actions or experiences can be organized in stages. This practice is considered to be pretty useful to make a person think about an event, activity or experience in detail. This makes people conscious of their own acts and enables them to correct and change their behavior for future events. People can learn a lot by seeing the positive and negative impacts of an activity. Gibbs model of reflection can be seen in the below image. Gibbs' Model of Reflection has six steps. This model can be very useful in helping you to think through all the stages of an activity or experience. Let’s discuss all these steps in more detail to get better know-how of each phase. 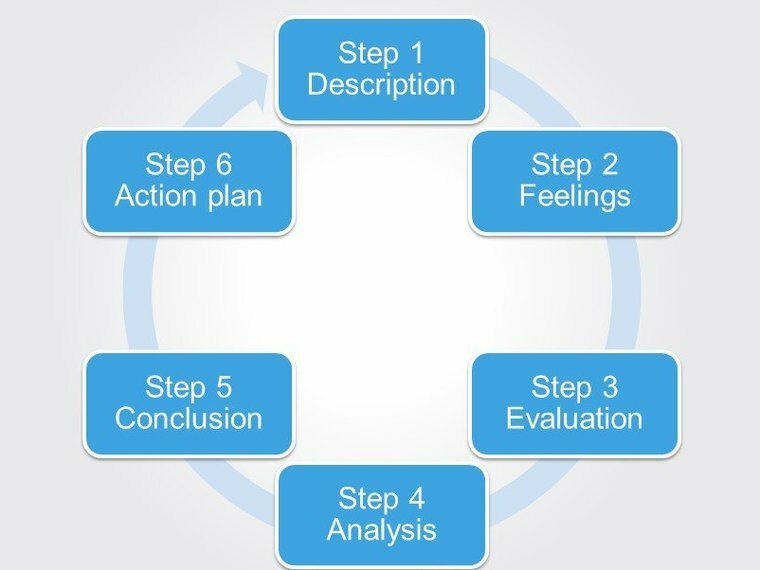 Gibbs reflective model begins at the description and continues left to right with feelings, assessment or evaluation, analysis or examination, conclusion, and action plan. This step discusses the situation, experience, activity or event in great detail without focusing on the conclusions immediately. The aim of a person at this stage must be to know what happened. One can ask these questions to get a better understanding of the situation. What was the consequence of the situation? What did you observe before the situation? What did you observe while the situation took place? What do others experience during this situation? What did you experience after the event? What do you think about the event right now? What do you think other folks think about the situation at this time? It might be a little difficult to know sincere feelings of a person. You can use techniques of empathic listening and perceptual position to know the actual feelings. This step involves the evaluation of Gibbs reflective cycle. Here you need to assess which method worked and which didn’t. One needs to imagine how things were when the incident happened. Reaction of other people when the incident happened also needs to be noted. You should also tell what you have learned from the incident. If you went through hard times during that event, then you should be able to understand what can resolve the problem at a later date. The questions below can be helpful in conducting a proper evaluation. What was the positive thing about this situation? Why was that positive activity? What that didn't go so well? What was the contribution of other people (either positive or negative)? This step is to find out what lesson you’ve acquired from the event, situation or activity. Based on the past experience, you can think to perform well if a similar situation arises in the future. You can write down both optimistic and bad things that you have experienced and then analyses these individually. Wise people always learn from their mistakes and become a better person with every passing day. The analysis is mostly done along with the evaluation. What things you could do to turn this event into a positive experience? What will be the strategy if the same event happens again in the future? What are the skills that you need to perform well in a similar event or activity? Action plan includes a list of things that can be practiced in a similar future situation. These things should eliminate the negative things that have happened last time when you experienced the event. A well-structured action plan can help you to become more effective if a similar incident happens. Don’t forget to review the progress when you implement the action plan in the next similar event. The true aim of Gibbs’ reflective cycle is to enable you to become a better person through learning from previous mistakes. This has always been essential for people to look back and learn from their own failures. Such mistakes can easily be avoided if identified through Gibbs’ reflective cycle. Using analysis in Gibbs’ model can be very effective because each stage helps you find the required information very easily. Like you can ask the proposed questions in each stage and get valid answers. Findings based on these questions are of great importance for anyone to become a better person in his life. Gibbs reflective cycle template can be accessed from the internet and you can enter answers for each question asked. Gibbs reflective cycle example can be used in different life experiences and useful lessons can be learned from these instances. Critical reflection is an effective reasoning process to make a useful meaning of an activity or experience. It is analytical, descriptive, critical, and can be expressed in a number of ways such as in oral form, written way or as an artistic impression. The following questions can be helpful in terms of critical reflection. What do I think are the noticeable features of the condition that I face? Why do I think those are the main features? What proof do I have for this belief? If I am correct about the event or activity, what results do I believe are necessary? Why do I think those results are required in that situation? If I am correct about the event and the desirability of the results, what actions do I think will give me the required results? Why do I think those particular actions will give outcomes in that situation? Gibbs reflective cycle in nursing is professional development of an active process triggered by the theory-practice gap. In such examples, nursing students describe the situation, visualize their emotional reaction, study their thoughts or feelings, critically analyze their performance, evaluate, find a conclusion and prepare an action plan.